Lisa Edmond is getting ready for her first day at a new job. She’s energetic, tech-savvy and positive. This is only the second job she’s had in her life, and she’s ready to tackle it. Lisa isn’t a Millennial or a recent college grad. She’s 61 years old, and her first job lasted 40 years. There’s a common misconception that when an adult over 50 loses their job, it’s because they’ve done something wrong — a tactical error or a failure of some kind. In reality, most unemployed older adults have done everything right; they’ve worked hard and planned carefully for the future. But when company structure changes and layoffs begin, decades of ladder-climbing and loyalty fall by the wayside. Hard work and well-laid plans notwithstanding, older adults may find themselves struggling to make ends meet in what should have been their golden years. Unexpected layoffs aren’t the only factor in this struggle. 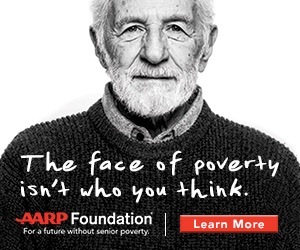 Savings lost to the Great Recession, caregiving responsibilities, and personal health setbacks have forced millions of older adults across America to let go of so much they labored to build — their hopes for their families, their dreams of retirement — and start again. Consequently, working later in life is a necessity, a means of averting a slide into poverty. 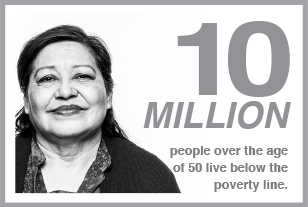 That’s not hyperbole: Some 10 million people over 50 in the U.S. live at or below the annual federal poverty level of $11,800, with another 37 million at risk. No dreams of a beach retirement here. 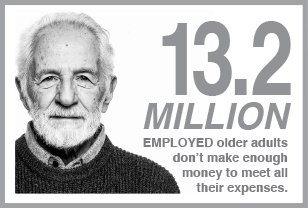 Even among the employed, more than 13.2 million low-income older adults don’t make enough money to meet their expenses despite working steadily. Facing uncertain futures, these are neighbors, friends and loved ones who are trying to balance employment while making difficult tradeoffs each day. Food or medicine? Rent or heat? The starkness of these choices is overwhelming. Poverty isn’t supposed to be part of the American Dream. Yet for a startling number of older adults, it’s a fact of life — a trend that often escapes attention. Despite earning most of the college and advanced degrees in the U.S., women make up nearly two-thirds of minimum-wage workers — the vast majority of whom get no paid sick days. A bout of the flu or a sick child can mean a day’s wages lost, which may mean a bill paid late or a meal missed. A costly unexpected occurrence — say, a stone bouncing off the road and punching a hole in the car radiator — may cause a low-income family’s already fragile financial stability to unravel completely. Other times, financial stress comes from being a caregiver for a loved one. Sixty percent of family caregivers in the U.S. are women. Of that number, 45 percent leave the workforce, making it harder to return to their careers later in life. When a woman leaves the labor force to care for a family member, it costs her as much as $324,000 in lifetime wages and benefits — substantially increasing her own risk of living in poverty in her later years. Like Dorothy — and like Lisa Edmond — many older adults never thought they’d be looking for work in their later years. When they re-enter the job market, they face challenges that their younger counterparts don’t. Low-income older workers may be stuck in low-skill jobs, and those skills may become less relevant as they age. They may have been doing the same kind of work all their lives and need to get up to speed with the latest technological advances. In some cases, there are physical limitations, especially for those who started out in careers involving heavy labor. They also have to learn to navigate a complicated modern job search, which can be daunting even for younger jobseekers. Obtaining and retaining good jobs can be difficult. As the nature of jobs has changed, so have the education, training and experience required for those jobs. Older adults are frequently overlooked when it comes to opportunities to take part in training and education programs; they may be unaware of these opportunities, or they may lack the confidence to pursue them, thinking that the time for learning new skills has come and gone. Ageism is a factor as well. Although it’s been 50 years since the enactment of the Age Discrimination in Employment Act (the federal law that protects workers and job applicants 40 and over from age-based bias in employment), discrimination rooted in preconceived notions about adults over 50 is still alive and well. The paradox is that outdated views about older workers have been disproved. As detailed in The Aging Workforce: Leveraging the Talents of Mature Employees, “mature workers are actually less resistant to change, are less likely to leave their organizations or miss work, are interested in learning new things and are more capable of keeping up with new developments in technology.” According to The Aging Workforce, while health care costs still tend to increase with age, the impact on the employer is minimal. The notion that employees over 50 cost significantly more than younger ones is a fallacy. Solutions like AARP Foundation’s workforce development programs dispel outdated perceptions about older workers and provide the training required to compete in today’s job market. Through AARP Foundation SCSEP, Dorothy Winters was able to acquire the skills she needed to successfully re-enter the workforce. And BACK TO WORK 50+ helped prepare Lisa Edmond for her job search and enabled her to get a job she loves. These and other workforce development programs recognize that in the modern business environment, a company’s most important asset is its human capital. With more than 25 percent of the labor force expected to be 55 or older by 2019, it’s vital that businesses recognize the value of older workers and of helping them obtain the right skills to meet the demands of today’s jobs. There’s no age limit on talent. But when it comes to seniors in the workforce, some fail to realize that older adults have some of our economy’s most in-demand skills. Soft skills, such as experience, loyalty, a strong work ethic, professionalism, and reliability, help older adults thrive and serve as mentors to younger counterparts. At a time when so much of our communication happens electronically, seniors are sought after for their willingness to have in-person conversations, whether with colleagues or with customers. Simply put, age diversity strengthens the workforce. Older workers are eager for the opportunity to learn. They want to provide even greater value. They want to continue to contribute their experience and knowledge. Like Lisa Edmond, the 61-year-old who found a new job after 40 years, they want to regain their footing, retain their sense of purpose, and remain a vibrant part of their community. The American Dream has changed for many who had envisioned palm trees and beach retirement, but financial security is still within reach. Hiring workers age 50 and over is essential to achieving that goal. It is a linchpin of prosperity and well-being — not just for workers themselves, but for our society as a whole.